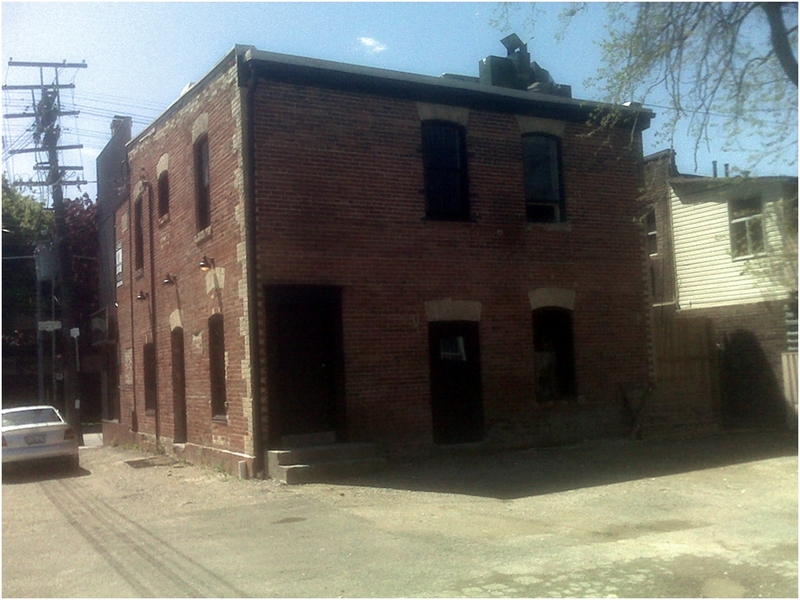 George Leslie was not the only Leslie in Leslieville: other of Clan Leslie lived on McGee Street and built it. McGee was originally called Darcy Street and was laid out in the mid 1860s and named after D’Arcy Boulton, a rich member of the Family Compact. (Bolton Avenue) is also named for him. 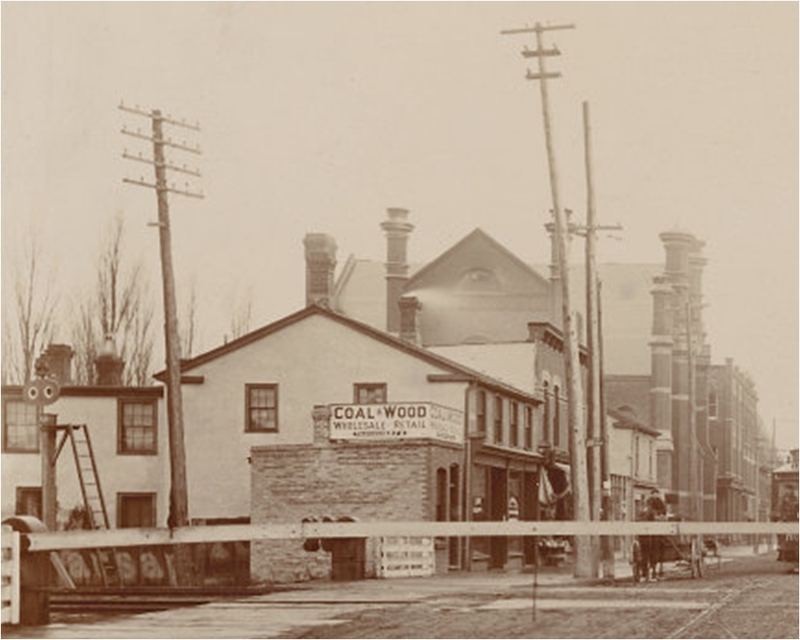 In 1877, to prevent confusion with another Darcy Avenue, the street was renamed McGee likely not after D’Arcy McGee (1825-1868) but the McGee family of grocers who lived at the corner of McGee and Queen. This Father of Confederation was assassinated on April 7, 1868 by an Irish nationalist. So the street was named after a murder victim, but crime on McGee did not stop there. 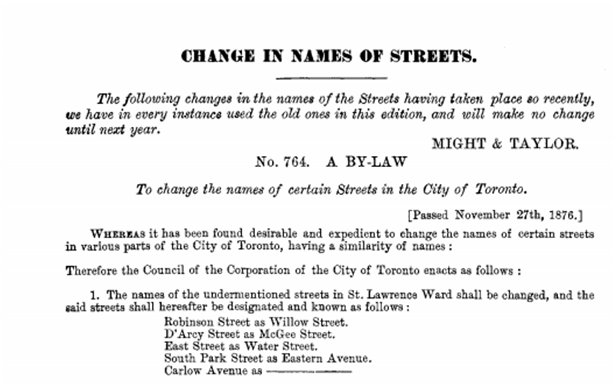 Robert Leslie had a business at Strange Street and Queen Street. And I will try to tell some very strange stories about this family of Leslies and others who lives (and died) on this short, but interesting, street. 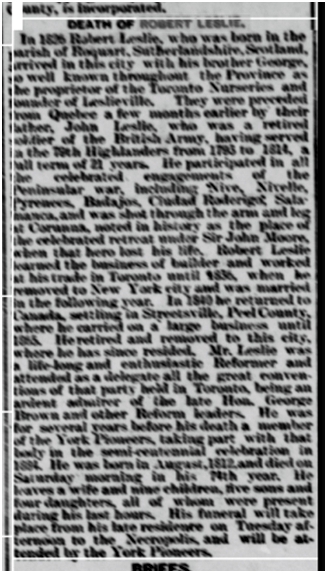 The other Leslie of Leslieville, Robert Leslie (1812-1886) came to Toronto with his brother George in 1826. 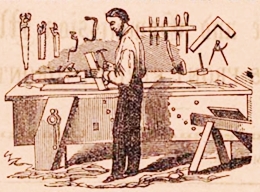 He became a carpenter and worked as a builder in Streetsville where George and Robert’s mother and stepfather settled in the 1820s. Robert stayed in Toronto until 1836, when he moved to New York City. He married Mary Ann House in New York City on March 22, 1837. (New York Evening Post, March 24, 1837) He remained in New York. Robert Leslie and Mary Ann House had twelve children: John Robert Leslie (1838–1899), James Edward Leslie (1841–1930), Philomela Margaret Leslie (1843–1917, George Henry Leslie (1846–1926), William Leslie (1847–1878), Frances Anna Leslie (1850–1914), Charles Leslie (1854–? 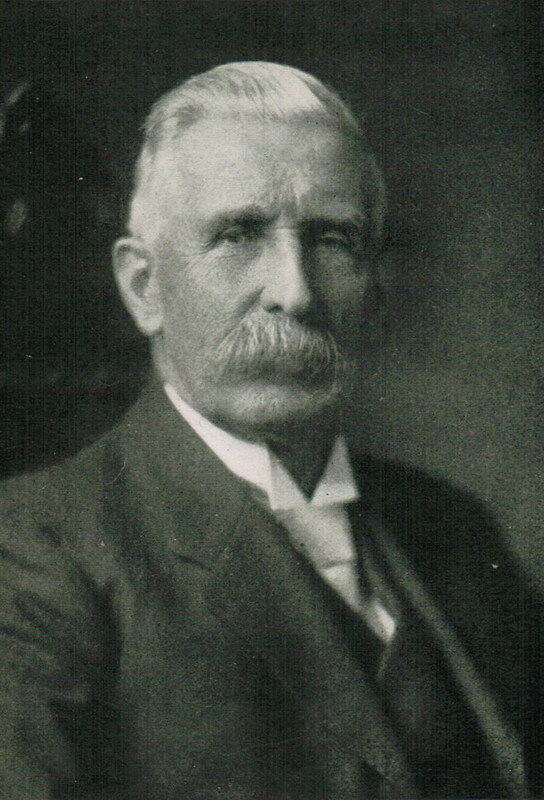 ), Alexander Chalmers Leslie (1854–1910), Norman Robert Leslie (1855–1939), Joseph Leslie (1859–? 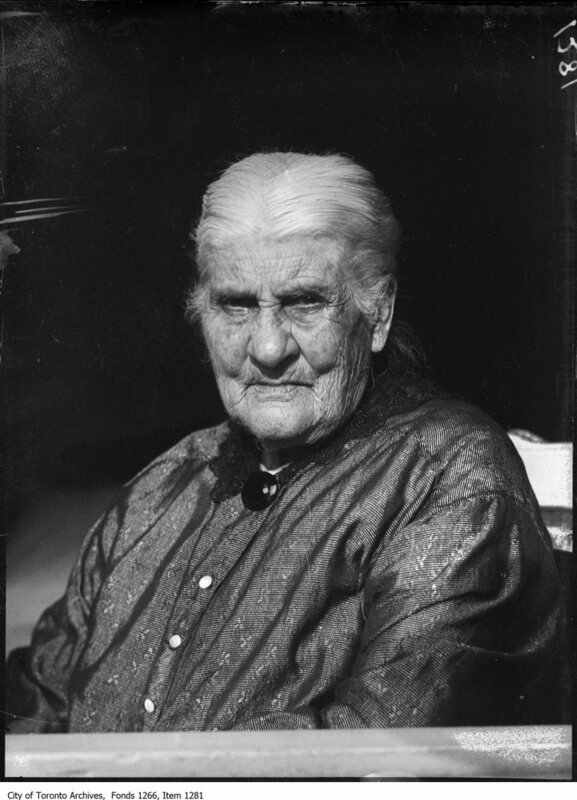 ), Josephine (Josie) Montrose Leslie (1860–after 1938), and Emma Leslie (1862–1947). Robert Leslie “retired” immediately, moved to Toronto and after several years came to Leslieville where he worked as a builder and contractor. In his later years, he became a cabinet and furniture maker with a store at the south east corner of Strange Street and Queen Street. The location of Leslie & Co. furniture store. City of Toronto Archives. Creator: Unknown Date: [189?] 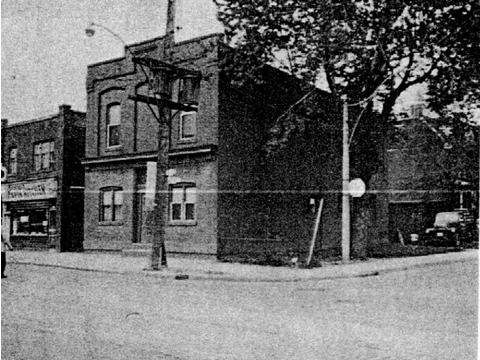 The corner of Queen and Strange Streets where Robert Leslie had his store is on the left near where the streetcar is. The address was 799 Queen Street East. It has always puzzled me why people don’t consider McGee Street in Leslieville because Robert Leslie family of six sons and six daughters living at 26 McGee Street (now demolished) must have stood out even at a time of large families. 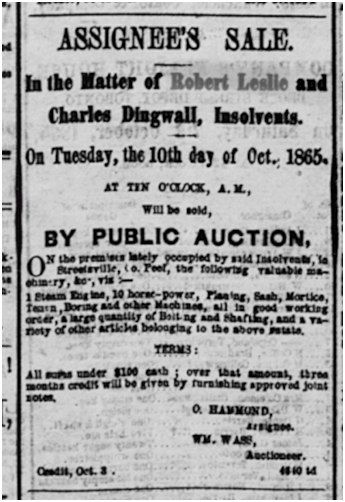 But Robert Leslie no doubt got a very sweet deal for his lot on McGee from brother George. It was no accident how Robert Leslie landed on McGee Street. His brother, George, owned the street! 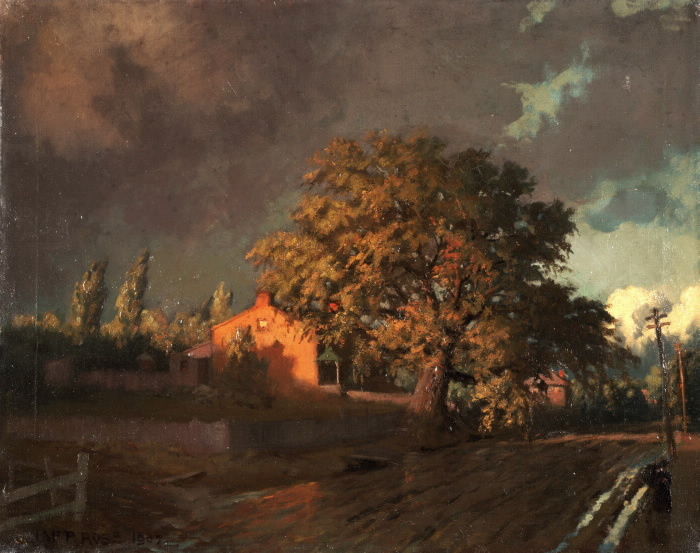 George Leslie (April 1, 1804- June 14, 1893) Painting attributed to John McPherson Ross. 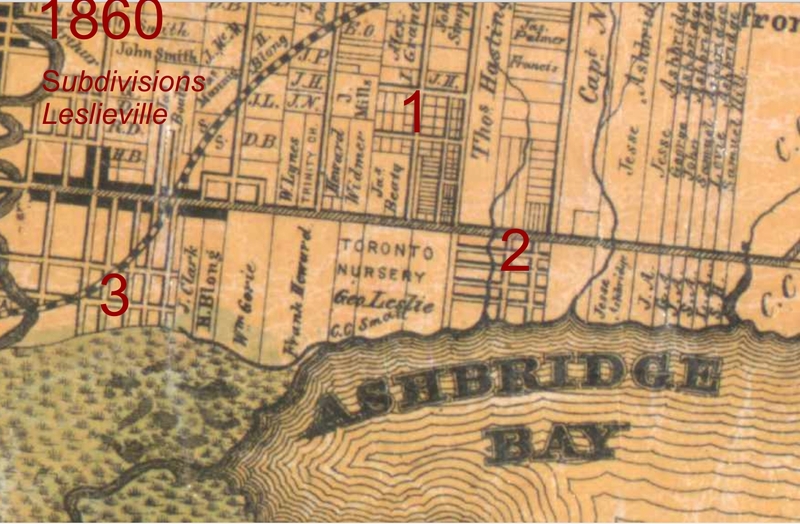 f) a large parcel of land on the north shore of Ashbridge’s Bay stretching westward from the foot of Leslie to what is now the foot of Pape. 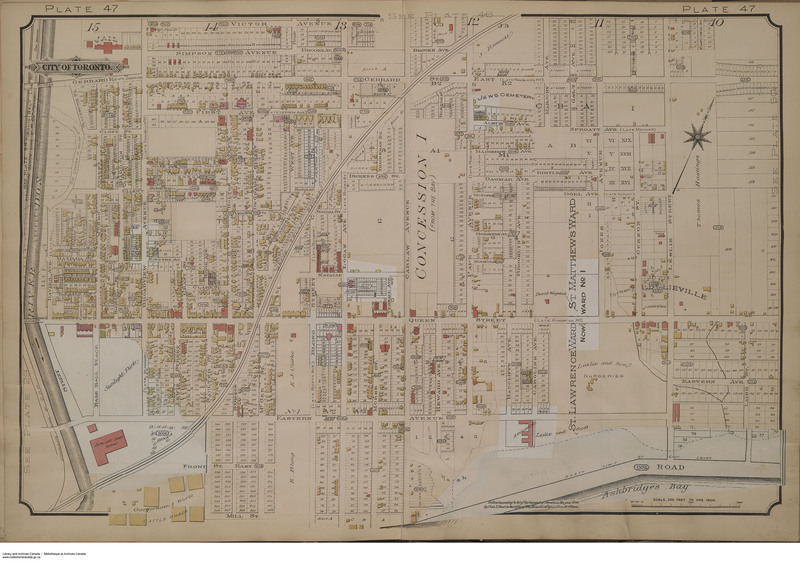 1860 Tremaine’s map showing Leslieville’s first subdivisions. His Toronto Nurseries occupies a large block of land from Caroline Avenue stretching eastward to Leslie and from Kingston Road on the north to Eastern Avenue on the south. Land speculators, like George Leslie, planned the first subdivisions including the first real subdivision in Leslieville. It was north of Kingston Road between Leslie and Curzon around the Roman Catholic Church and School. 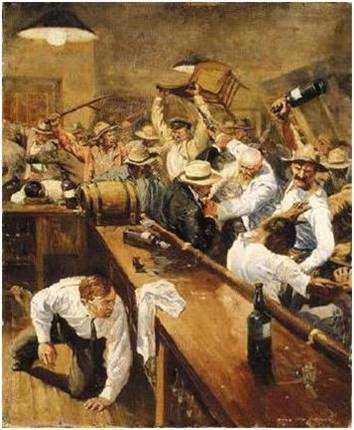 George Leslie was a singularly open-minded man who had no problems with selling to Irish Catholics. (The Protestant foreman of Leslie’s Nurseries married a Catholic and wasn’t fired or reprimanded in any way). 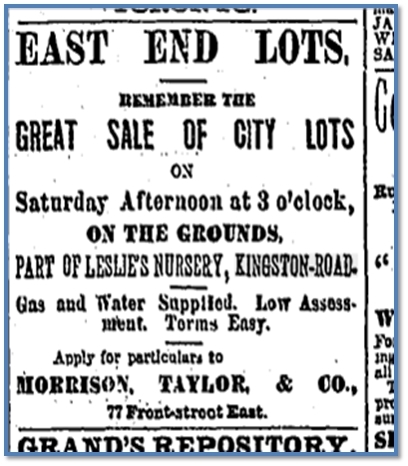 The second subdivision, dominated by Protestants, was south of Kingston Road, between Leslie and Lake (Knox Avenue). The third was George Leslie’s second venture as a developer. 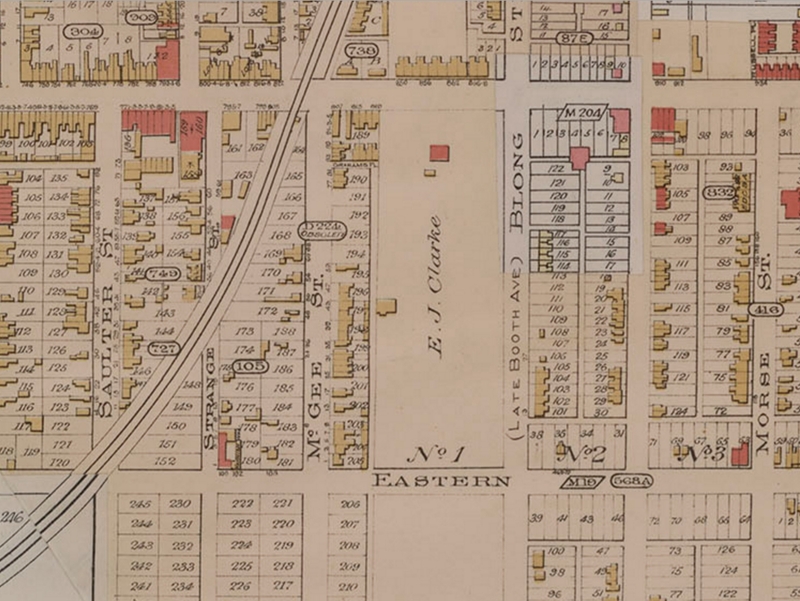 He bought a triangular piece of land at the west end of Leslieville near Eastern and McGee and laid out streets and plots. McGee Street was not a very desirable location. The street was in terrible shape, but for years Queen Street wasn’t much better. By John McPherson Ross. 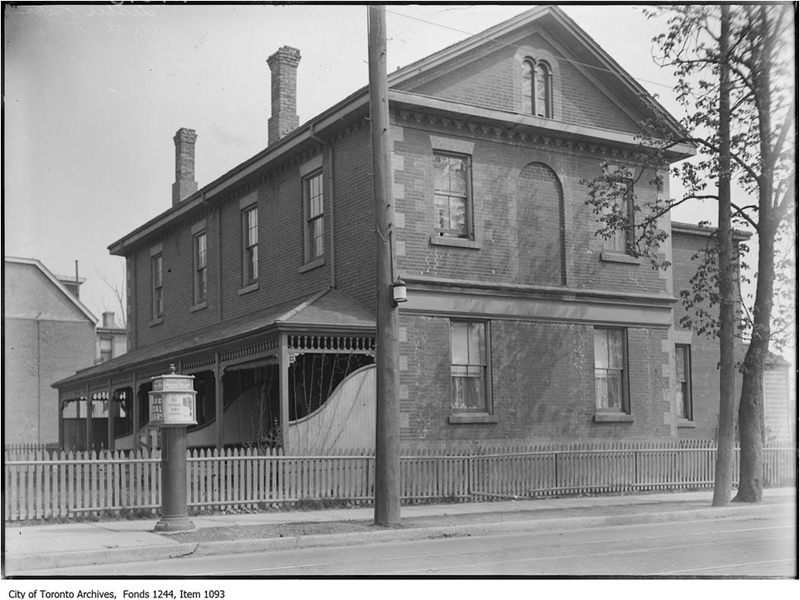 This is the northeast corner of Pape and Queen and home of Alexander Muir (at one end of the double cottage) and Toronto’s first High Constable William Higgins at the other. The road is a quagmire. In 1859, George Leslie moved his residence from his frame house to a much bigger new brick house at Jones Avenue and Queen Street. At north east corner of Jones and Queen Street East, where the Leslieville mural is on the wall. Leslie General Store and Post Office, built around 1871, at the northwest corner of Queen and Curzon. A Grade Seven class at Leslie Street Public School produced a written history of Leslieville in 1957 as a social studies project. Their illustrated booklet “Leslieville of Yesteryear” is a permanent record of the students’ work under teacher Milson DeGaris. Students interviewed local residents, went through photo albums and read family records since there was little published material for them to draw on. They discovered that the site of their school site was once a piggery. 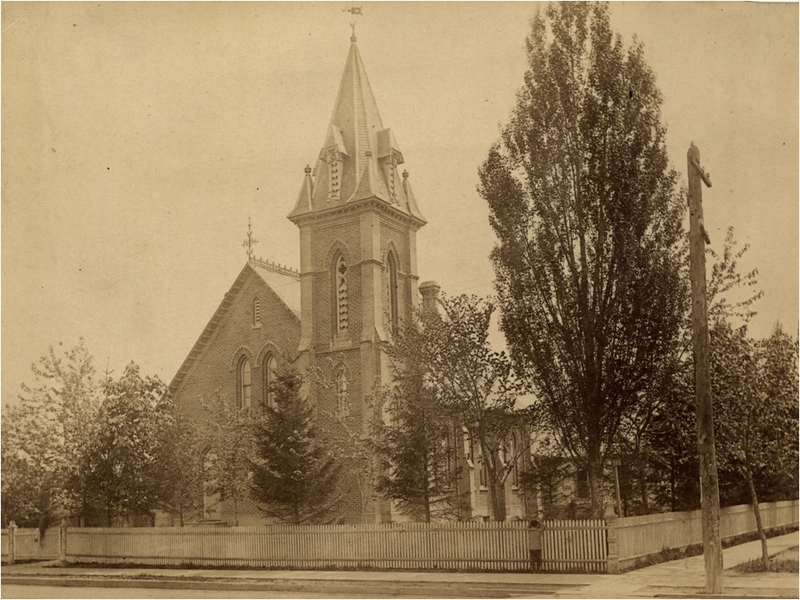 Leslieville Presbyterian Church, now Queen Street Presbyterian Church, at the corner of Queen and Carlaw. Photo from the Toronto Public Archives. 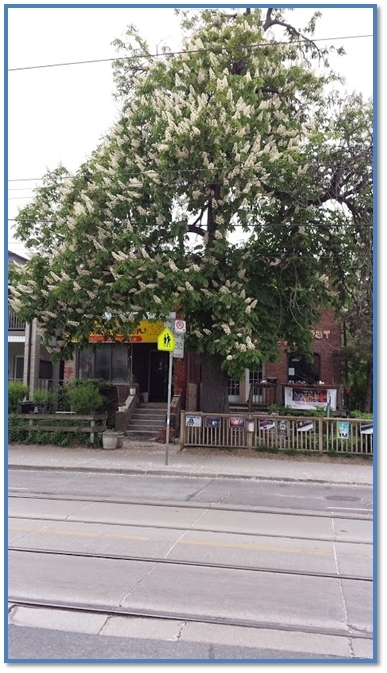 He also donated the land for Eastern Avenue through Leslieville and lined it with one his favourite trees, horse chestnuts, as he did Kingston Road (now Queen Street East). A “double house” of rough cast, photo, 1931, Ctiy of Toronto Archives. Trefann and Creemore in Regent’s Park. 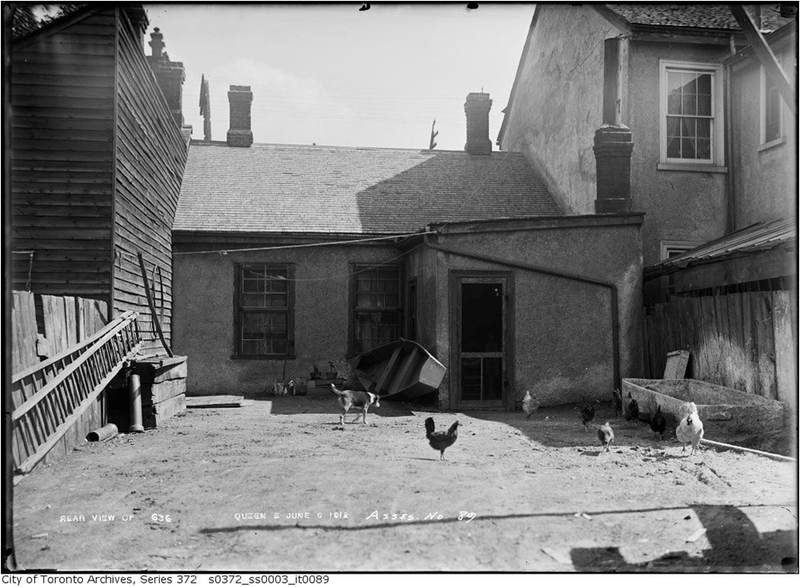 Rear of rough cast house at 636 Queen St E. Houses like this, including poultry, were very common in Leslieville and were built on McGee Street. If any remain they no longer resemble their original form. Today a single developer usually handles the whole process of developing a subdivision from buying agricultural land, laying it out in streets, assigning lots, building houses and selling them. But, back then, land owners usually sold their property to a land agent. The agent divided it into lots and sold five of the lots to this person, four to that, etc. Then the person with five lots put up houses himself or paid someone else, usually a local builder, such as Robert Leslie to build them. So it is quite likely that Robert Leslie and his sons built most of the housing along McGee and neighbouring streets. Robert Leslie was a master builder, who built many smaller homes and buildings still standing on Leslieville’s streets, but his surviving masterpieces are in Peel Region. 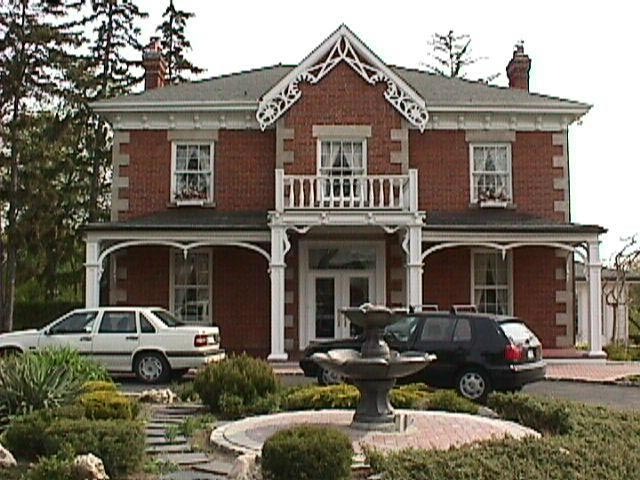 In 1857 Robert Leslie, Charles Caldwell and Robert Heron Leslie built the majestic Benares House for the Harris family in Clarkson. 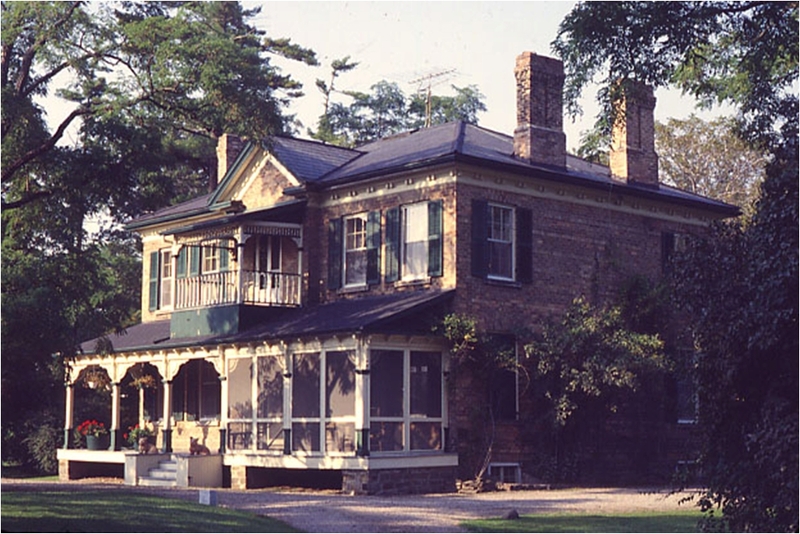 The house was donated to the Ontario heritage Foundation in 1968 and restored. It is owned and operated by the City of Mississauga. The William Barber House is also attributed to Robert Leslie. 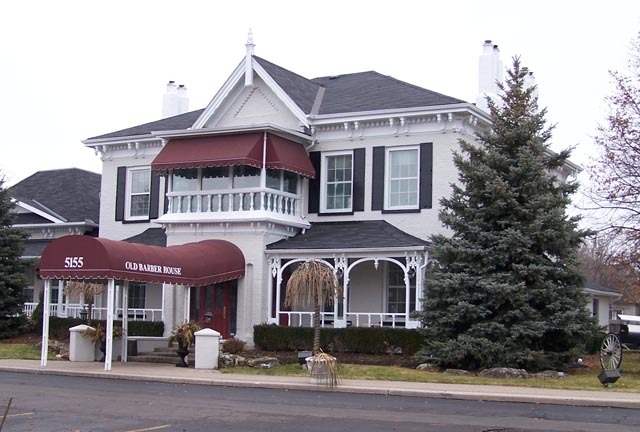 The City of Mississauga designated this amazing Italianate house under the Ontario Heritage Act in 1982. 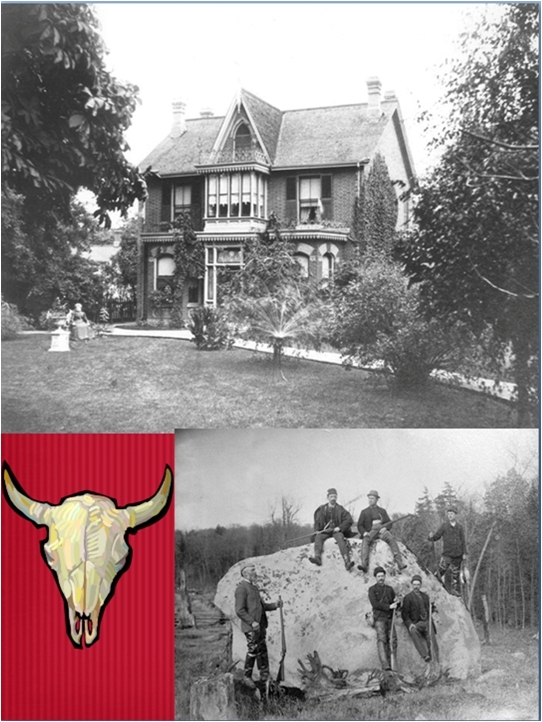 The Hammond House in Erindale was finished in 1866 but so was Robert Leslie’s building career in the area. 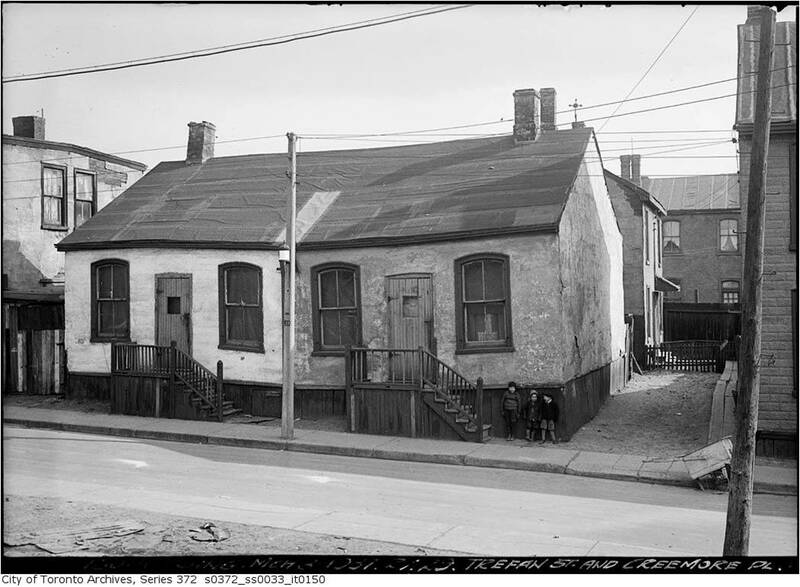 The Blong House which stood on the south side of Queen Street between Logan and Empire. Some of the Blong ladies in their front yard and some of the young butchers of the neighbourhood on a hunting trip “up north”. Photos are from a private collection. YOU CAN’T HAVE HIM! OH YES I CAN! When Josephine Leslie ran off with her lover, Edmond J. Clarke, her family brought charges of abduction against the man. This was done by families of under aged girls in the Victorian era to protect the reputation of the family. 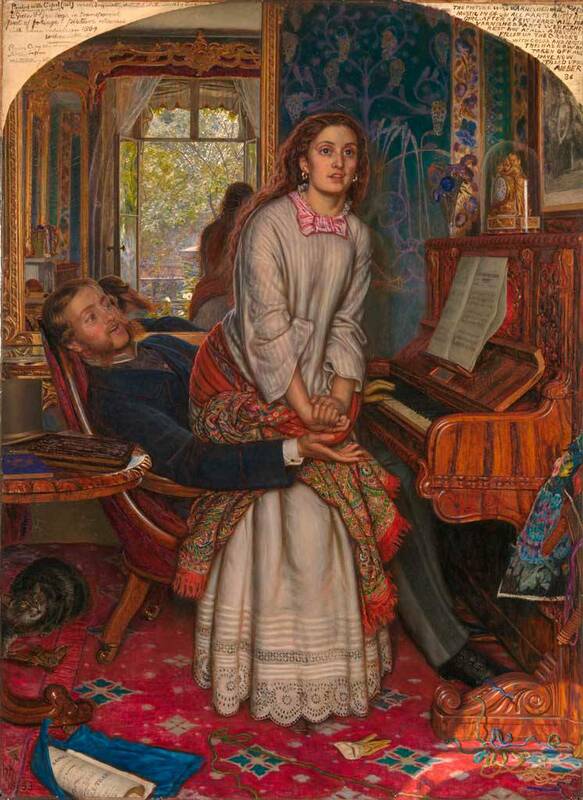 William Holman Hunt: The Awakening Conscience, 1853. Portrait of George Taylor Denison III from his memoirs, Reflections of a Police Magistrate (The Musson Book Co., 1920). 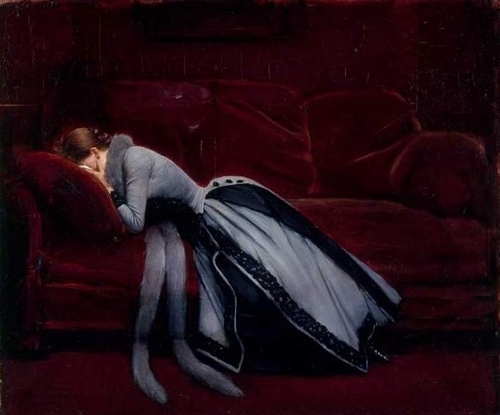 THE ABDUCTION CASE was a Victorian melodrama played out in courtroom packed with titillated spectators who “appeared very eager to hear the case”. 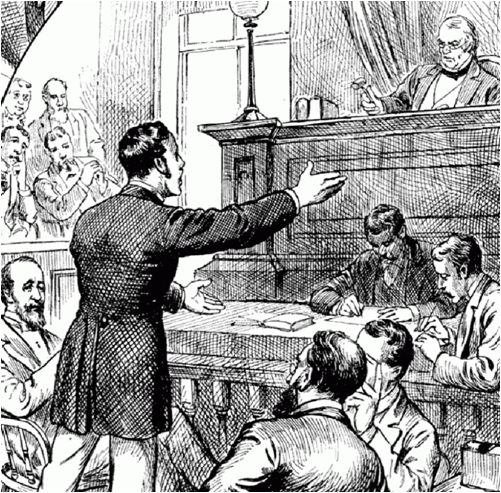 19th century illustration of jury trial. Source unknown. Public domain. Clarke called out from McGee Street to Josephine who her family kept under lock and key in her bedroom. When Clarke persisted, John Leslie beat him up; Clarke did not fight back. 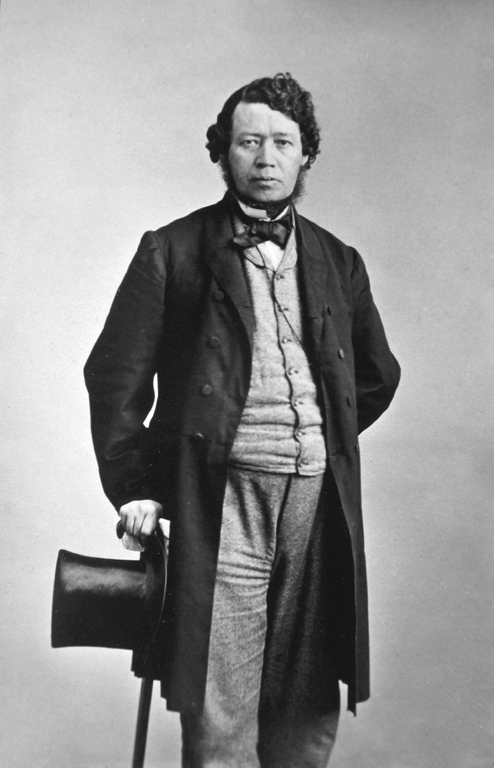 According to John Leslie’s own words, Clarke was cut about the face considerably, and had a black eye.” Clarke said (and very apparently Josephine agreed) that if he couldn’t get a divorce in Canada, they would run off to the States and get married there. 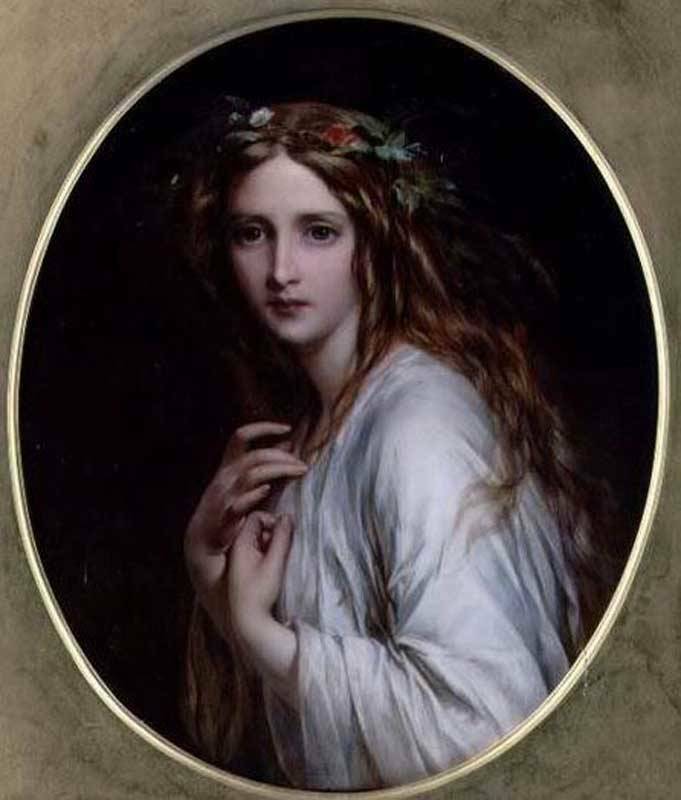 Thomas Francis Dicksee, Ofelia, 1861. The Magistrate said he would say something now which might have the effect of causing the defence to alter their plans. He had considered the evidence very fully, and he had heard enough to enable him to form an idea of the facts of the case. he did not know how the evidence for the defence would affect his opinion; but his impression was that he would convict the prisoner unless something of a remarkable character came out. 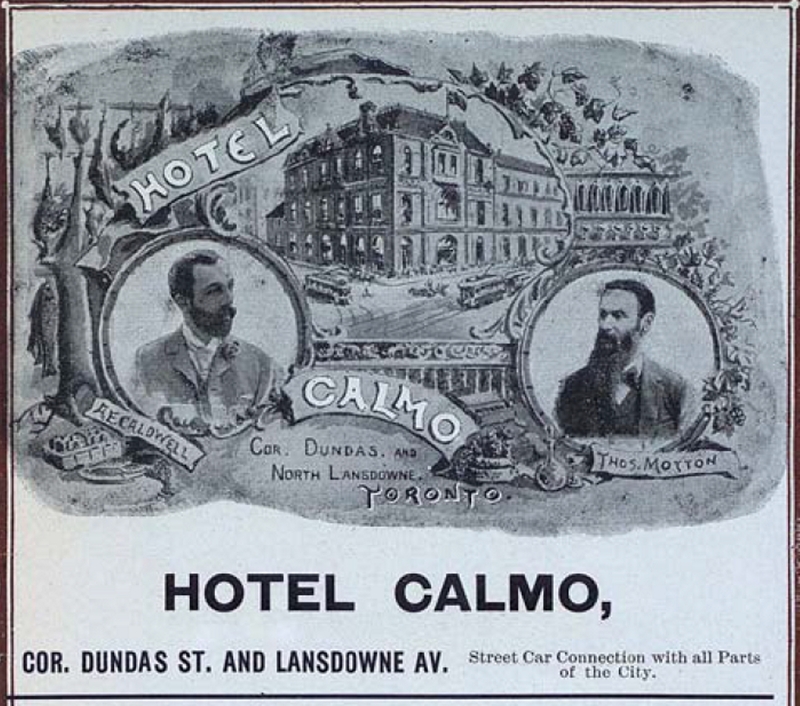 In perhaps the rest of the family could have used a vacation at the Hotel Calmo (see picture). The “Leslie abduction” shocked people, but there was a far more grisly case, a true crime, and the ghost of Willie Long may haunt McGee Street to this day. Uncle Tom’s Cabin, Toronto Public Library. The bar was in the front. At the back of the building was the Orange Lodge Hall where dances, parties and other social occasions were held. William Long had serious facial and skull fractures and died on July 19, 1882. Long was only 24. If anyone had a reason to haunt McGee Street looking for the murderers who never did time for the crime, it is poor Willie Long. Robert Leslie was the unofficial leader of McGee Street, just as his brother George fought for the rights of people in the village named after him. 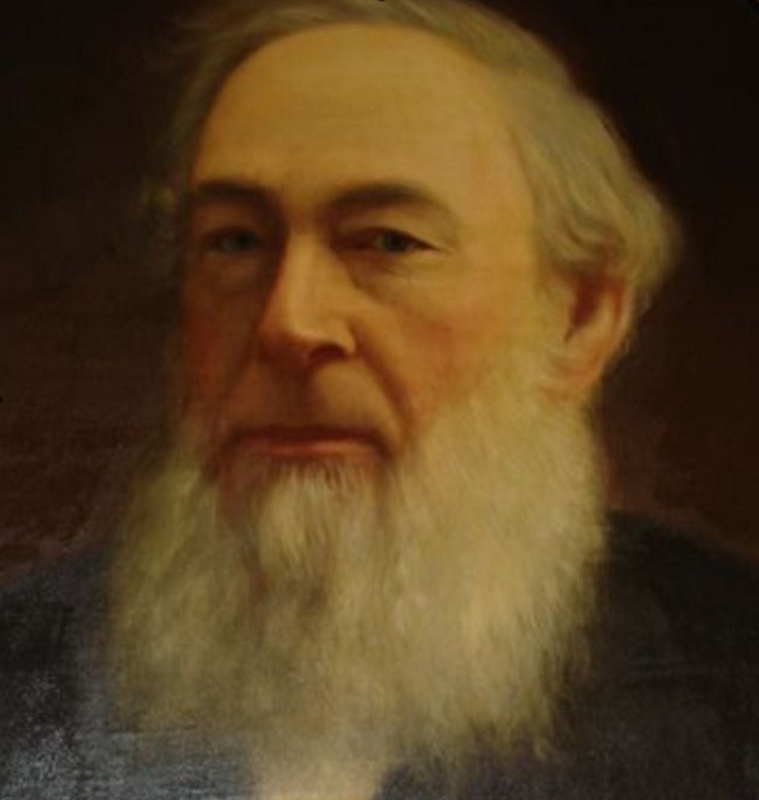 Robert Leslie died in 1886. The Globe notes that he left “a wife and nine children, five sons and four daughters, all of whom were present during his last hour”, but he had one daughter who wasn’t there: the black sheep, Josie. Robert Leslie is buried in Toronto’s Necropolis Cemetery where his brother George would be buried a few years later. After his death Mary Ann House (1817-1907) continued to live in the family home, no doubt built by Robert with his sons, at 26 McGee Street. The area became poorer in the 1890s and the industrialization intense. Smoke from Consumer Gas and other nearby industries made the earth thick, but people saw it differently. Smoke meant people had jobs. Mrs. O’Brien, 56 McGee St.August 11, 1923City of Toronto Archives, Globe and Mail fonds, Fonds 1266, Item 1281. And so this story of marriage, murder and muddy McGee Street ends, but another will appear soon as I am researching another mystery related to Morse Street.